On the first day of the Giveaway, we gave you the chance to win a John Lewis hamper filled with goodies worth £25! All you have to do was to join and share our Facebook event and retweet this tweet @Union_Soton to double your chances of getting the first prize. Did you know that our best-selling item in The Shop is our pain au chocolat, so to celebrate this much-loved treat, on Day 2 of the Giveaway we were offering you the chance to win a pastry (pain au chocolat or croissant) every day during your second semester. The 500th customer got to take away the prize, which was Emma Paull. On Day 3, we celebrated our sportspeople, by offering 2 Varsity 2017 tickets for the Woman or Man of the match at any of the day’s Team Southampton or Intramural winning matches (either home or away). We had some deserving entries, but Alex Loveridge took home Woman of the March for her victory against Bristol at Squash. We know how you love Karaoke at The Stag’s, so we gave away 12 pints of beer at random to the students who signed-up to sing a song. We had an incredible 47 sign-ups, with our very own SUSUtv taking away the booze, which they’ll enjoy in the New Year for their rendition of Frozen’s Let It Go. Diana Holdsworth was the lucky winner of Day 5’s competition. To launch the first Senate, we were giving away a burger and milkshake in the Diner. All you had to do was submit your questions or feedback to You Make Change at www.unionsouthampton.org/you-make-change. Diana asked ‘Is the uni going to do anything to ensure that non local students (both current and new) won’t be affected by the new changes once implemented?’ – you can view our Full-Time Officers’ responses online. ‘There’s no such thing as a free lunch (or dinner! )’ – are you sure?! We proved this to be a myth, as we gave away a free meal worth £30. All you had to do was ‘like’ The Bridge Facebook page at www.facebook.com/TheBridgeSoton. Katie Stoddart was the luck winner, who’ll be picking up her prize after Christmas. Ellen Barker and her friends smashed Day 7’s giveaway. They won Domino’s for winning The Bridge Quiz and Curry. You can have a go yourself every Sunday. Day 8’s prize wasn’t claimed, so we’ll keep hold of the ticket for another time. To celebrate the Grand Tour, we asked you to send us your selfies with a flash car via Twitter, tagging us @Union_Soton The most expensive car in the photo wins! Thomas Critchlow absolutely wiped the floor on Day 9, when he sent in a picture of himself with an Aston Martin DB10. Only 10 have ever been made, so the other entries unfortunately didn’t come close! He is now enjoying his Amazon Prime membership over the holidays. Hansin Patel took home a University of Southampton branded hoodie on Day 10 after taking part in our Snapchat scavenger hunt. After contacting him, Hansin kindly popped back in to have his photo taken wearing his prize3. There’s nothing like a food prize, so we offered you a Christmas dinner for free on Day 11. Day 12 was the big one – we offered you the chance to win a Kindle! All you had to do was catch the cat! We know you love a bit of Susu, so we got our very own Dan Varley to brave the heat and don the costume to become Susu once again. 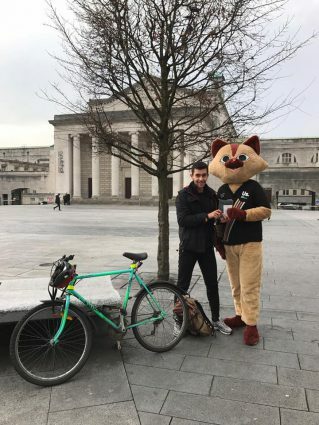 We went on a wild goose chase across Southampton including the airport, the Unilink buses and the Union – all you had to do was follow us via our photo clues on Snapchat @union_soton and be the first to catch the cat. Mahmood was the lucky winner, who showed his commitment by following us the whole way on his bike! Here is Mahmood posing with Susu, claiming his victory prize. Thank you to everyone who took part in the competition, we had a great time and we hope you did too. Enjoy your prizes and have an incredible Christmas!